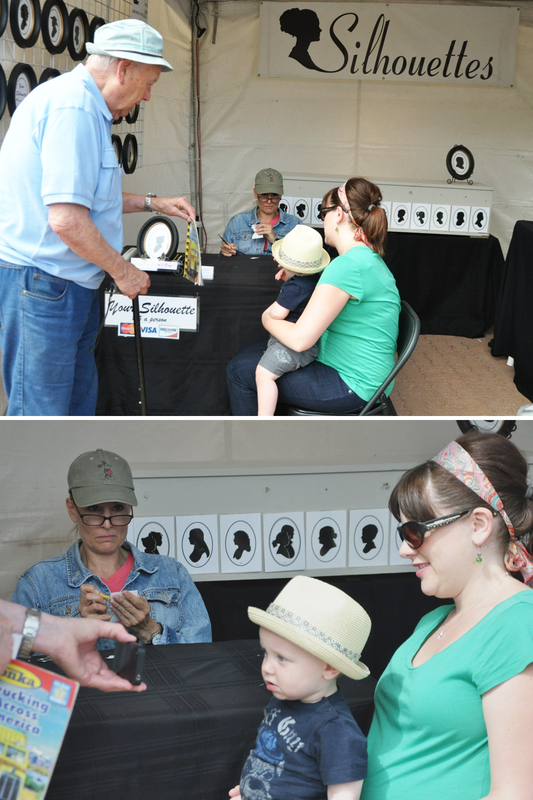 The Kenton silhouette was a souvenir from the San Diego County Fair this summer. 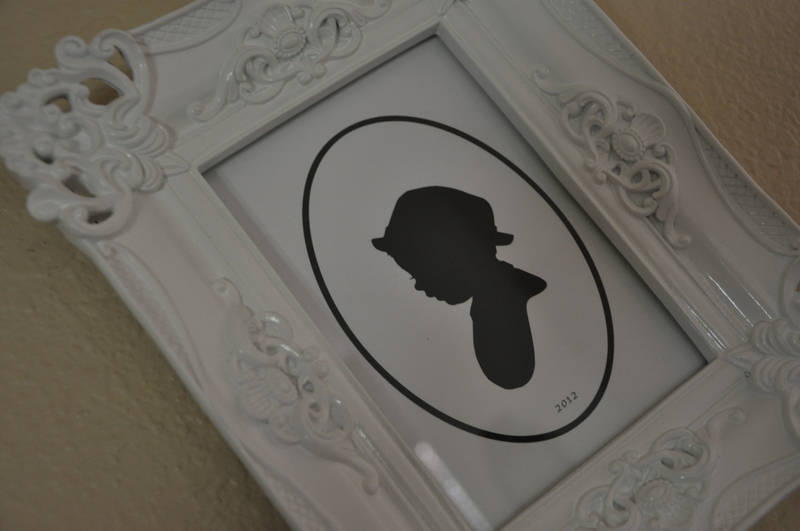 There are approximately 400 million DIY tutorials out there for silhouettes. Or, you can pay the gal at the fair $15 to cut one for you – which is what I opted for. My Grandpa helped keep Kenton looking in one direction by playing his first birthday video, which he’ll watch over and over and over and over. Something about seeing himself on screen – he loves it. 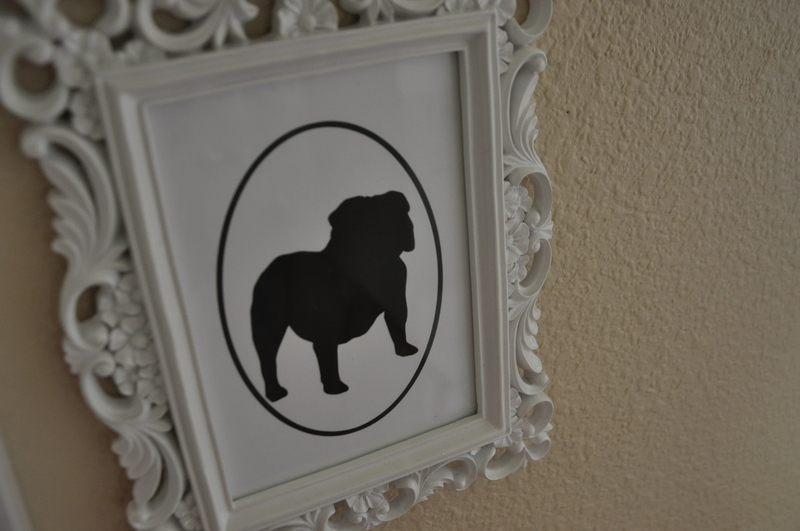 She was also selling pre-done silhouettes of dog breeds. Of course, I couldn’t resist taking a Bulldog off her hands. I found the white frames at TJ Maxx for $7 each. 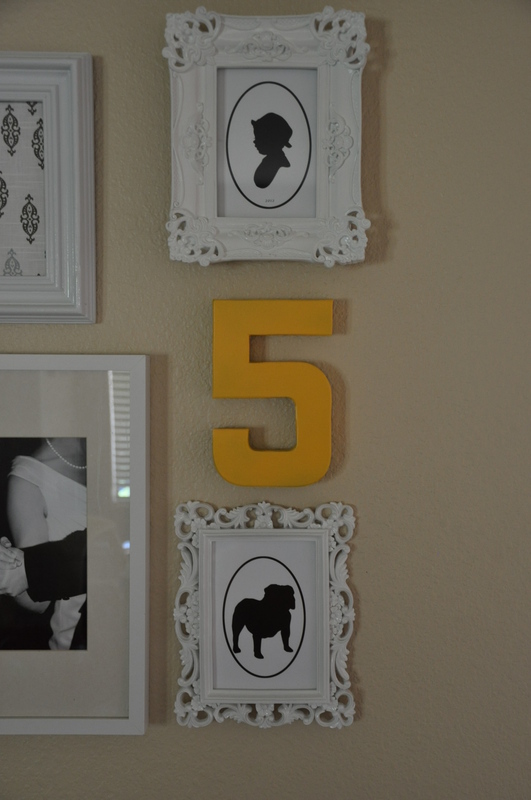 Jason + Michelle + Kenton + Baby + Bowdoin the Bulldog = 5. 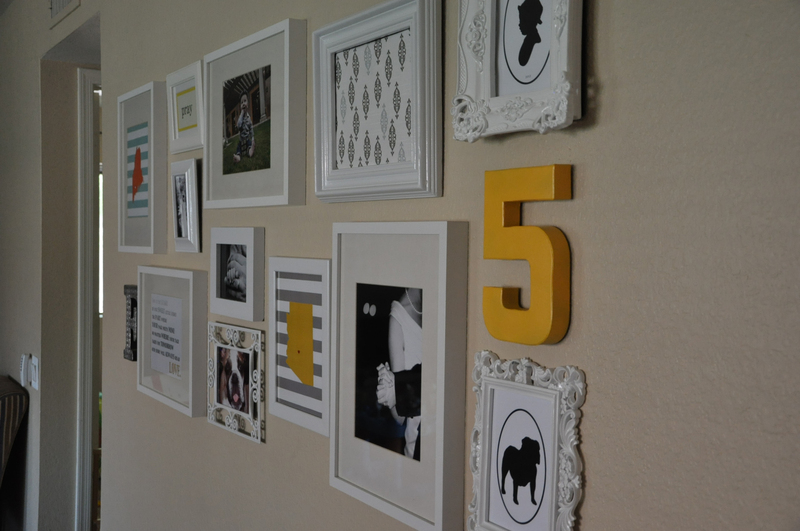 The yellow is the same shade that accents Kenton’s nursery. 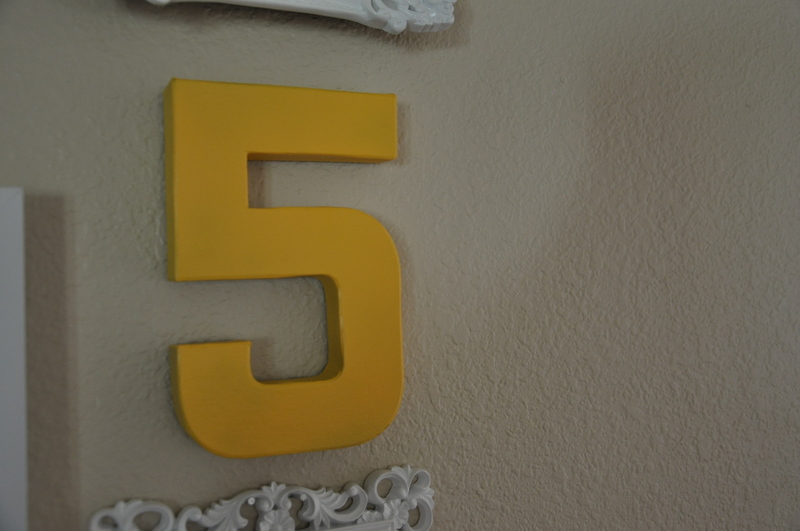 I’ve decided to bring that pop of yellow throughout the house occasionally… in an attempt to tie things together a bit better. I just love this wall. I don’t know why it took me so long to put it together in the first place! 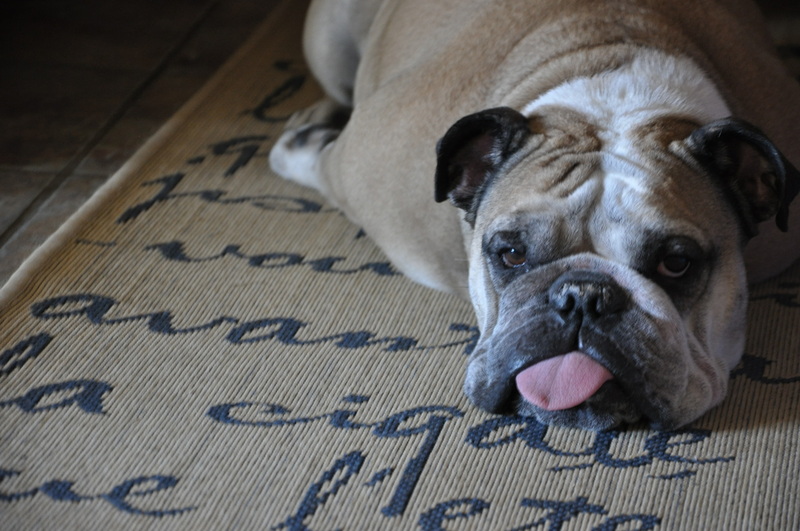 Bowdoin, by the way, is hanging out on the new rug in our family room (! )… more on that later. Michelle Fortin is a follower of Jesus, a wife and a mom. She's also an award winning broadcast journalist and public relations professional. Michelle spent nearly a decade working in television newsrooms across the country, both behind and in front of the camera. Training future broadcast journalists in her faculty associate roles at the Walter Cronkite School of Journalism at Arizona State University and at Arizona Christian University was a cherished focus of her post-TV career. 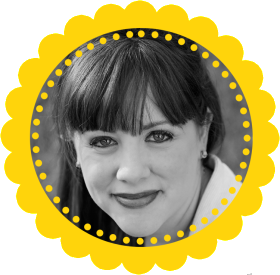 Today, she maintains a roster of public relations clients focused on empowering fellow “momprenuers.” She also serves as a speaker for various women's and mom's events. Michelle received her bachelor’s degree from Biola University and Master of Mass Communication (MMC) from Arizona State University. 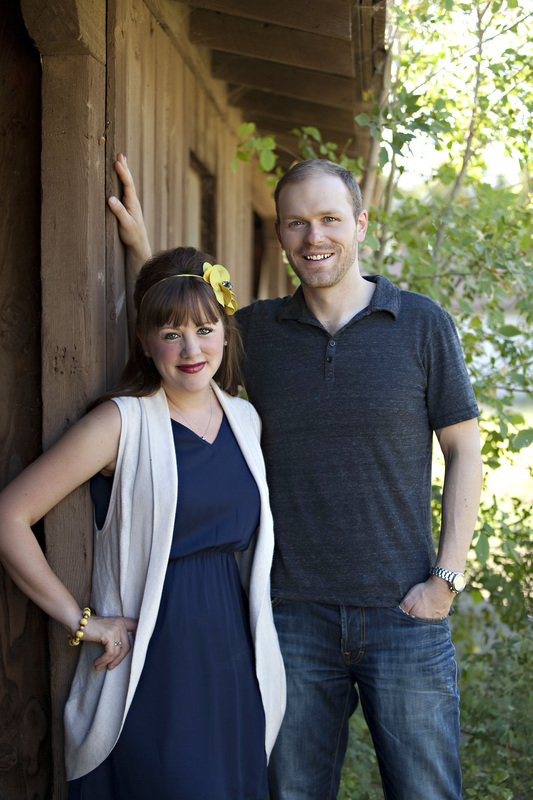 She and her husband, two young kids and English bulldog call Scottsdale, Arizona, home. This looks great. I love the addition of the yellow letter. And I totally has a w in my room that I need to paint. I’ve only had it for a year or so. Love it! I love that you can always add or take away from it. 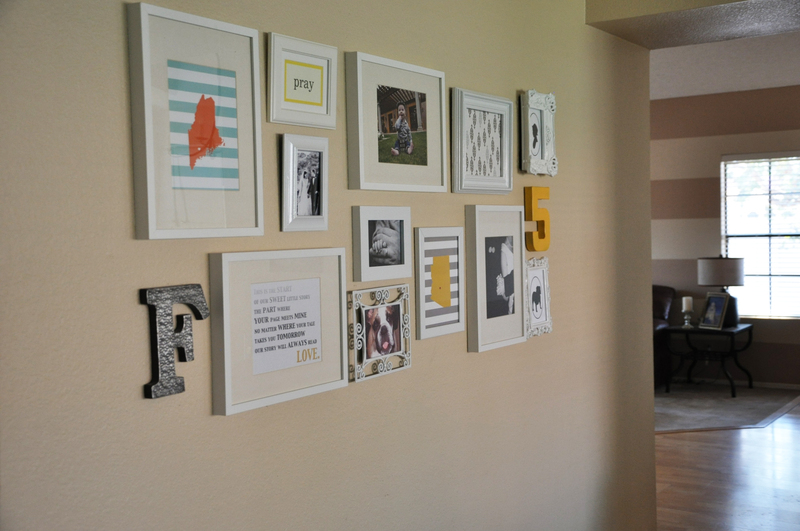 I need to get started on my gallery wall!